The REFEX20D Restaurant Exhaust Fan is recommended for commercial restaurant hoods that are between 4′ and 6′ using medium duty equipment. 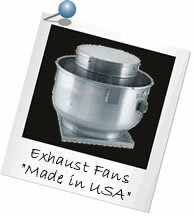 Our exhaust fans are constructed with heavy gauge aluminum and feature a 90-day warranty on all electric motors. Direct drive motors and belt drive motors are encased in a weather-tight compartment. All drives are factory set.